Berlin, 17 January, 2019: Atotech announced today that it will introduce its latest panel level plating processes and equipment solution for high resolution pattern plating during the NEPCON Japan show, held January 16 to 18, 2019, at Tokyo Big Sight. Atotech experts will be available at booth E25-16, to discuss this and other highlight products, such as their precise chemical processes and manufacturing equipment solutions, which are specifically designed to handle customers current and future needs. MultiPlate® is Atotech’s revolutionary plating tool which facilitates both, wafer and panel level packaging, in formats up to 650 x 610 mm. While ensuring that plating occurs at the highest current densities and achieving excellent uniformity of the plated structures, its double-sided plating capability enables improved warpage compensation. 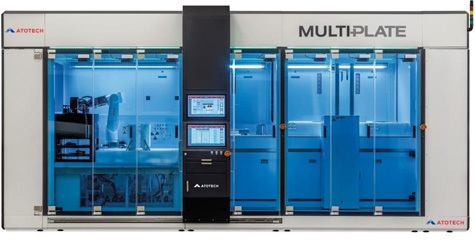 MultiPlate®’s versatility and multi-functionality helps tackle the current and future challenges for optimal performance in advanced packaging technologies. NovaBond® EX is Atotech’s new and next generation adhesion promoter for advanced package substrates. The horizontal solution provides customers with a unique and reliable process for both inner layer bonding and solder resist materials while providing a smooth interface of < 150nm Ra. The short process operates at low temperatures and short dwell times for higher productivity. NovaBond® EX is compatible with the main materials in use, or planned by, principal OEMs as defined in their future technology roadmaps.